Everyone who has ever tried to lose weight knows the mental and emotional battles involved—especially when you “blow it” and lose momentum. This has been my first experience with a weight-loss plan during which I’ve been able to stay fairly balanced, emotionally. I’m not sure why—probably God’s grace combined with a small degree of emotional maturity after so many years with this battle. Taking it not only one day at a time, but one bite at a time, really helps. So, a couple of weeks ago when I had my first really serious binge (on homemade fudge) instead of getting depressed and continuing to over eat the following days, I let myself enjoy the fudge (lots of it!) as an annual event, and continued the plan immediately. Amazingly, I didn’t gain any weight. Enter Christmas holidays and our trip to Denver to be with kids and grandkids. And lots of wonderful homemade food. Some of my favorites were: Honey-baked ham, potato casserole, green bean bundles (wrapped with bacon), homemade sugar cookies with icing, and egg nog! We were gone for five days. I made a decision to count calories four of those days and just enjoy myself (but with some moderation) on Christmas Day. Well, I ended up with second servings on Christmas day, something I haven’t done in months! But it was a conscious decision, so I enjoyed every bite (and sip) and didn’t worry about the weight. The next day I didn’t feel like I was “starting over” but just continuing what I now believe will be my new lifestyle—mindful eating with rare intentional binges. So, when we got back to Memphis and I got on the scales, I had GAINED ONE POUND. 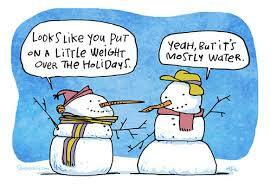 (According to this article, people tend to gain a couple of pounds during the holidays.) That’s the only time in four months I’ve gained any weight, but it was only one pound, so I’m a happy camper. I know it may take a week to lose it again, but that Christmas feast was awesome! As the New Year approaches, I’ll continue my plan…. Hoping to reach my goal weight by May, when we have a trip to Paris planned. Am I worried about gaining it back in Paris? Not really. Although French food and wine are wonderful, it’s French women who inspire me. 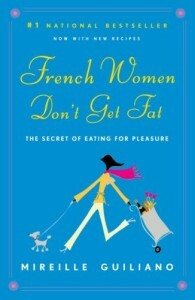 Remember the book, French Women Don’t Get Fat, by Mireille Guiliano? (Read more about her here.) The premise is that (most) French women (1) walk everywhere they go, which we can’t really do in Memphis (but I try to work out on the elliptical) and (2) eat VERY SMALL amounts of really GOOD FOOD being very INTENTIONAL. I’ve really been learning to do that, and I’m getting used to this new lifestyle. Can’t wait to get to Paris! Hope y’all had a wonderful Christmas! Hope you ENJOYED it, Aubrey Leigh! love you! Happy to hear you had a wonderful Christmas celebration with your family! I appreciate your balanced perspective on your new lifestyle. Good for you! Thanks, Joanne! Happy New Year!